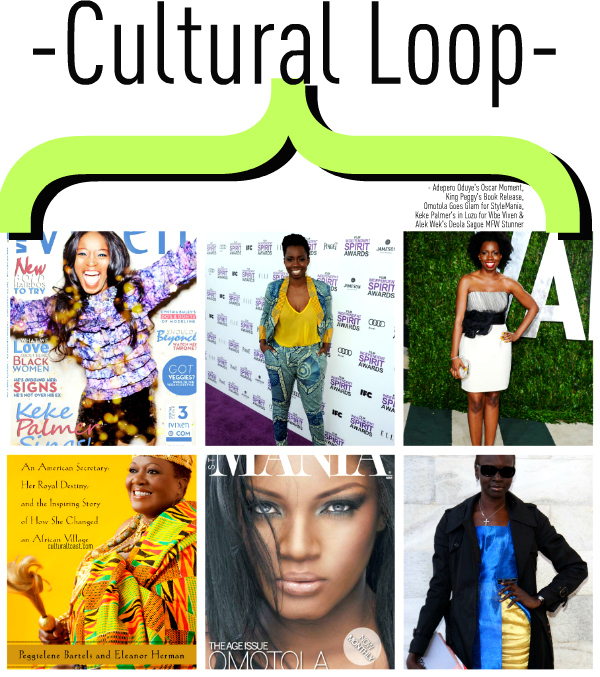 This new edition of Cultural Loop highlights Adepero’s Post-Oscar moment, King Peggy’s Book release, Omotola’s glam StyleMania Magazine cover, Keke Palmer’s wearing Loza Maléombho on the cover of Vibe Vixen and Sudanese model Alek Wek bringing Aso-Oke to Milan Fashion Week! 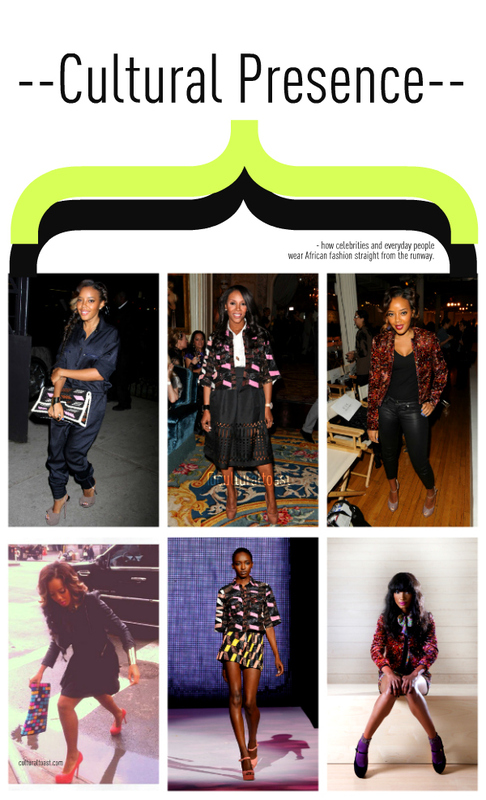 Pariah breakthrough star Adepero Oduye shined at the 2012 Vanity Fair Post-Oscar party. Adepero joined Oscar nominee Viola Davis and Oscar’s In Memoriam performance star Esperanza Spalding in celebrating natural hair. 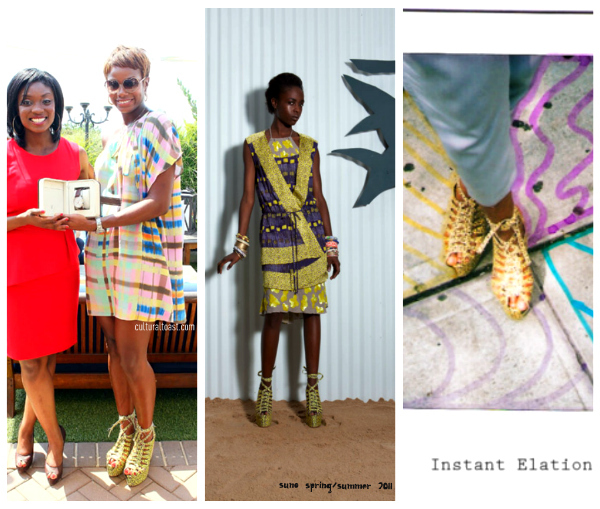 Prior to her Oscar appearance, Adepero as CulturalToast.com first published on Tumblr stepped out in a two-piece yellow and blue ankara paint suit at the 2012 Independent Spirit Awards. 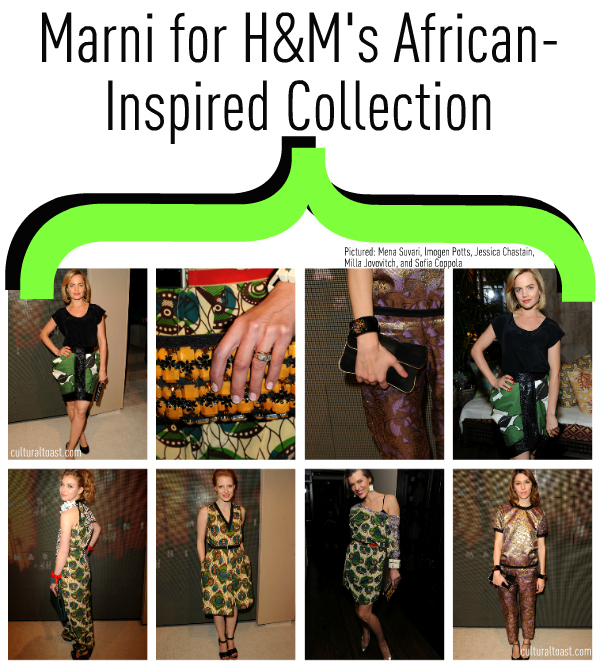 Food for thought: Wouldn’t it be great to see Macy AND H&M collaobrating with Jewel By Lisa and prominent African fashion designers like Washington Roberts, Maki Oh, Tsemaye Binitie, Lanre Da Silva, Virgos Lounge and Chichia London for their in-store designer collaborative initiatives??? During my weekly peruse of Barnes & Noble, I check out a hot new recommendation called King Peggy: An American Secretary, Her Royal Destiny, and the Inspiring Story of How She Changed An African Village. 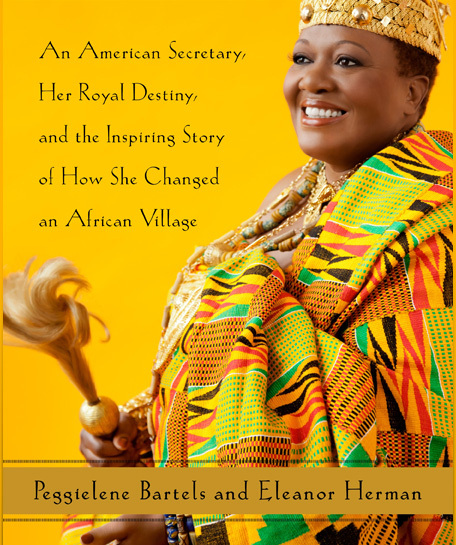 The book chronicles how Peggielene Bartels went from being a secretary at Ghana’s Embassy in Washington, D.C to becoming African royalty of her late uncle’s village Otuam. Visit her official website on where to buy her book and to see her book tour dates. This clip highlights the accomplishments King Peggy made during her month-long Fall 2012 trip to Ghana. She not only distributed food to needy families but open a new well. What a class act! 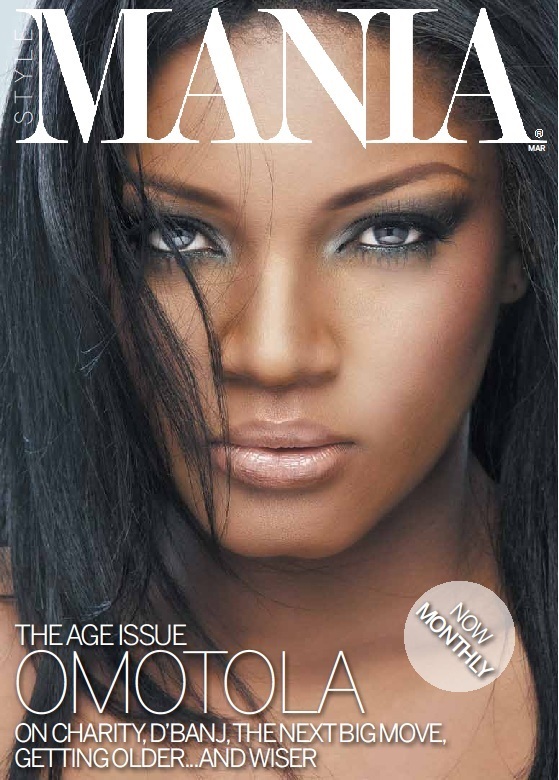 Nollywood starlet Omotola Jolade-Ekeinde shot a stunning cover shoot for StyleMania March 2012 Magazine. This is by far her best looking cover feature. Follow Omotola on Twitter (@realomosexy) to keep up her latest Nollywood projects. See the full shoot over at OnoBello.com! 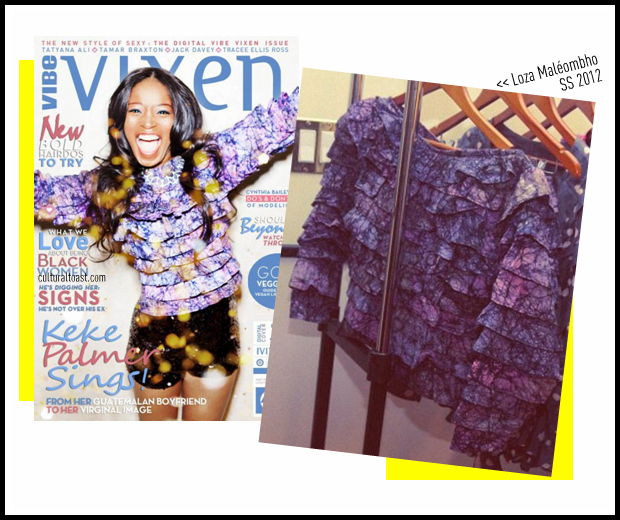 Actress Keke Palmer stuck a pose in a Loza Maléombho printed ruffle blouse from her Spring/Summer 2012 collection for the new digitial Vibe Vixen December 2011/January 2012 issue. 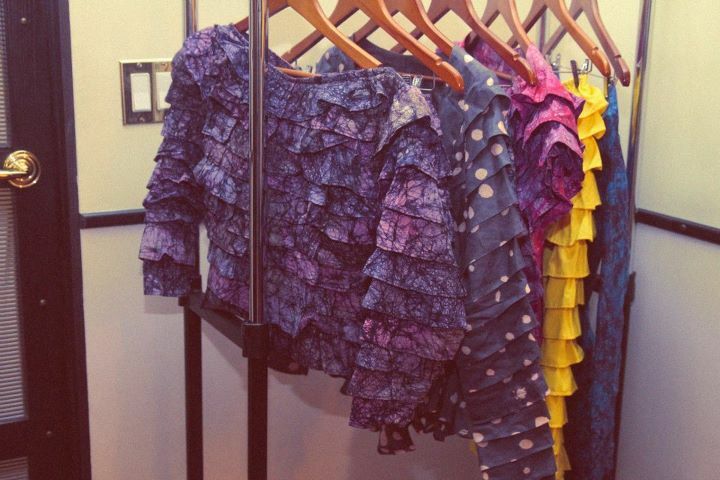 You can check out Loza’s SS 2012 collection via Facebook. Loza, born in Brazil and raised in Abidjan and Cote D’Ivoire, is a womenswear designer based in New York with a strong mission of women empowerment, social and economic trades in West Africa. 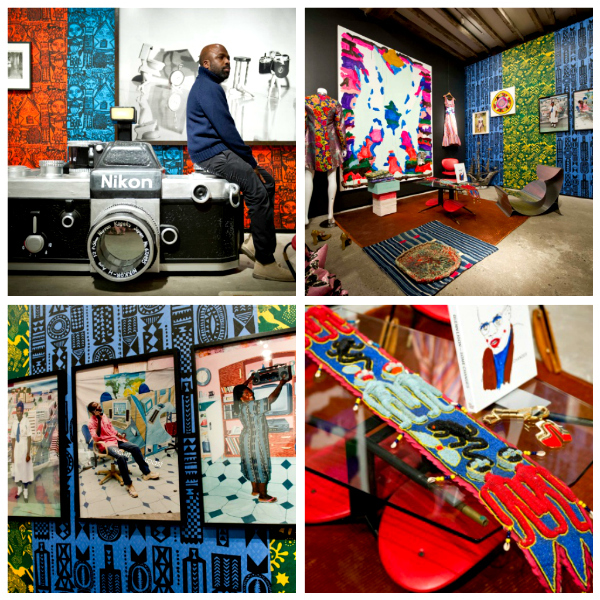 Loza’s fly and social conscious – gotta love it! Sudanese model Alek Wek wore a blue and gold Deola Sagoe Aso-oke dress to Roberto Cavalli Fall 2012 show during Milan Fashion Week. Alek first wore this dress and the same gold criss-cross heels for the inaugural issue of Arise magazine back in November 2008 and at a JoinRED event. Great to see Alek continue to support Deola! 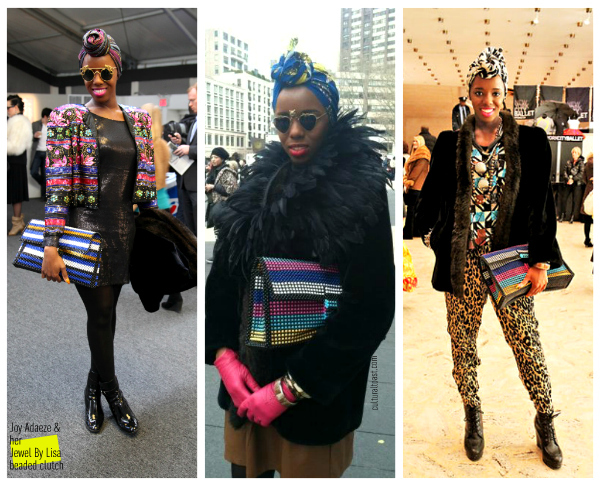 This is a style repeat offender that I appreciate! 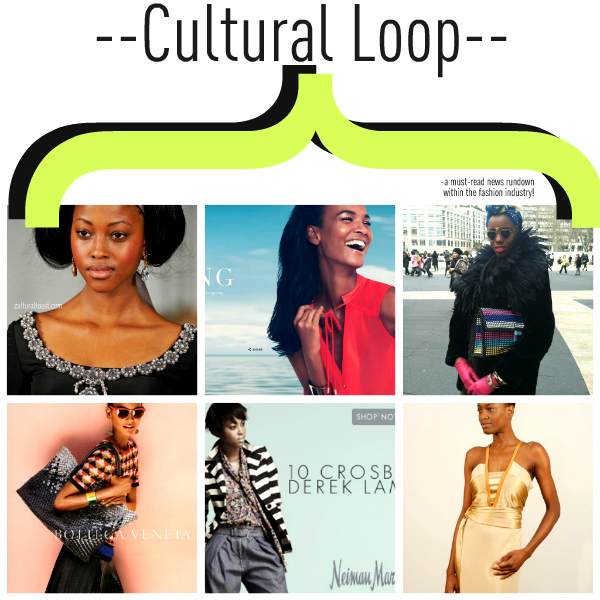 Adama-Paris (Senegal/France), Amine Bendriouich Couture and BS (Germany/Morocco), Amrapali (India), Angelo Van Mol(Belgium/Ghana), Be-Grey (Nigeria), Bestow Elan (UK/Ghana), Bridget Awosika (Nigeria), Buki Akib (UK/Nigeria), CHICHIA(UK/Tanzania), Christie Brown (Ghana), CLAN (Nigeria), David David London (UK), Davida (Nigeria), Duaba Serwa (Ghana),Ejiro Amos Tafiri (Nigeria), Eki Orleans (UK/Nigeria), Frank Osodi (Nigeria), Funlayo Déri (UK/Nigeria), Gavin Rajah(South Africa), Gloria Wavamuno (Uganda), HOUSE of DIVAS (Nigeria), House of Farrah (Nigeria), House of Nwocha (Nigeria),ICONIC INVANITY (Nigeria), Imane Ayissi (France/Cameroon), Jacob Kimmie (UK/South Africa), Jewel by Lisa (Nigeria), Kastle Designs & Treasure Chest (USA/Ghana), Kaveke (Kenya/UK), Kevan Hall (USA), Kezia Frederick (UK/St.Lucia), Kiki Clothing(Ghana), Kinabuti (Italy), Klûk-CGDT (South Africa), Koke (Botswana/India), Korto Momolu (USA/Liberia), Lanre Da Silva Ajayi(Nigeria), LaQuan Smith (USA), Laurenceairline (France/Ivory Coast), Loza Maléomsho (USA/Ivory Coast), Madam Wokie’s Couture (Sierra Leone), Mai Atafo (Nigeria), Maki-Oh (Nigeria), Mataano (USA/Somalia), Meena (Nigeria), Mustafa Hassanali(Tanzania), NKWO (UK/Nigeria), Odio Mimonet (Nigeria), Okunoren Twins (Nigeria), Osman (UK), Paul Hervé ELISABETH(Martinique), Poisa (Kenya), Re Bahia (UK/Nigeria), Sandra Kennedy (Jamaica), Sandra Muendane (Mozambique/Portugal),Sunny Rose (Nigeria/UK), Taibo Bacar (Mozambique), the Vessel. By Lois (USA/Jamaica), Tiffany Amber (Nigeria), Timo Welland (USA/South Africa), Tsemaye Binitie (UK/Nigeria), U.Mi-1 (UK/Nigeria), Virgos Lounge (UK/Nigeria), Viv La Resistance(Nigeria), William Okpo (USA/Nigeria) and Zekaryas Solomon (Eritrea/UK). 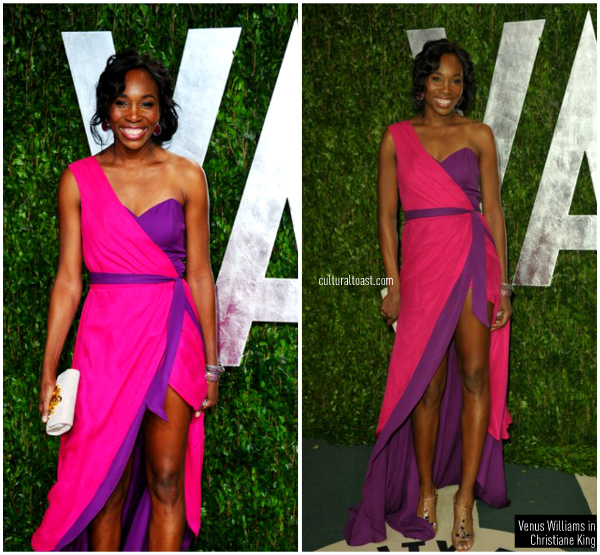 Tennis sibling champions Venus & Serena Williams stepped out in stunning custom-made gowns by Christiane King at the 2012 Vanity Fair Post-Oscar bash! Serena wore a curve-hugging mustard yellow mermaid look from the Project Runaway alum’s Atelier while Venus channelled a Grecian-inspired look in a youthful color-block neon pink and purple dress. Venus accessorized with a white and gold clutch while Serena let her emerald green and gold jewelry be her statement pieces. Serena went for a Old Hollywood look with her side-part hairstyle but kept her look current with her open-back dress. 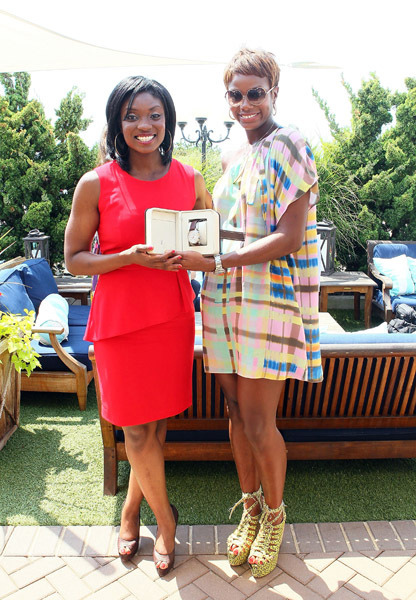 Venus’s dress bought out her best features – her legs. 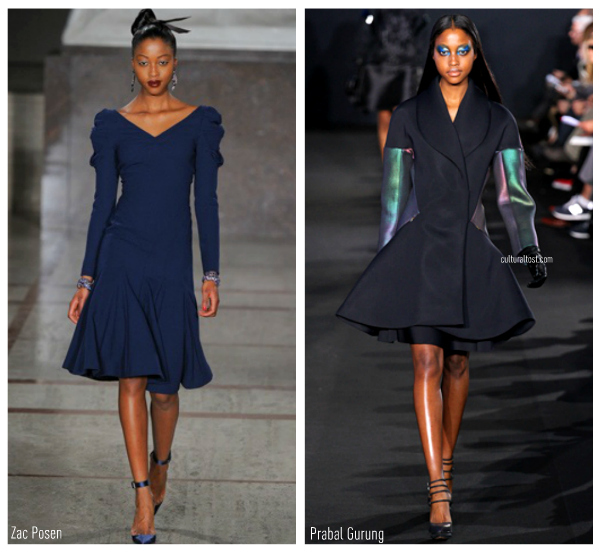 Which Christiane King dress did you love more on the Williams sisters – Venus or Serena? 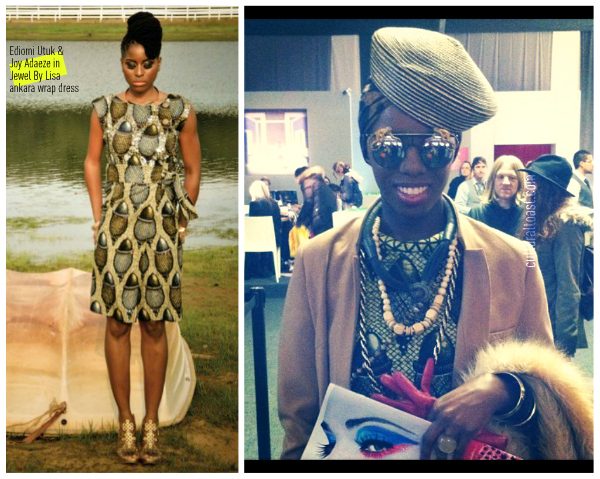 We are definitely excited to see such exquisite designs from a African fashion designer on the Oscar red carpet. We are not only thrilled and overjoyed for Christiane King but extremely happy! The last time a celebrity worn custom-made Christiane King designs on a major red carpet was when Kendra Wilkinson dazzled in a winter white look during Golden Globes 2012 weekend! 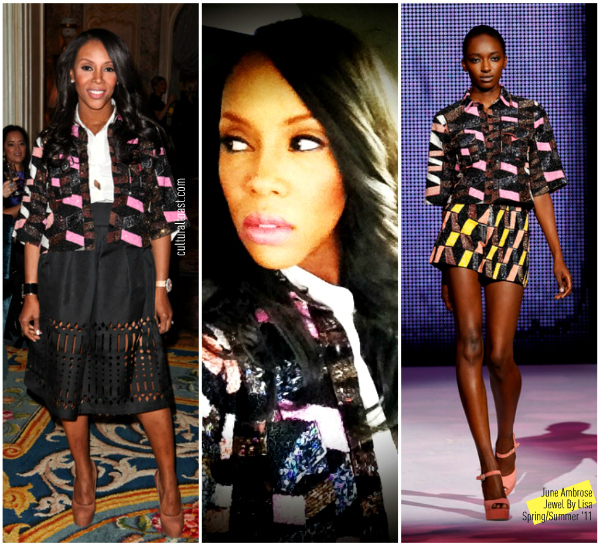 Be sure to visit Christiane King’s Facebook page to see what other celebrity can’t resist wearing her designs. Congrats to the entire team at Christiane King for a job well-done! 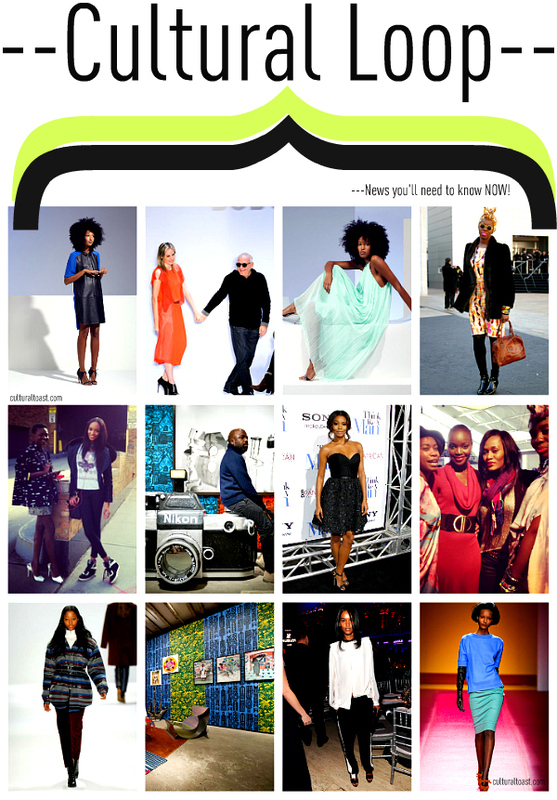 Munaluchi Bride Magazine Introduces Debut Digital Winter 2012 Issue! We are truly excited about this next stage and delighted to release the cover of our debut digital issue, the Winter 2012 edition, featuring THE most gorgeous bouquet by the one and only Janie Medley of The Brides Cafe and photographed by Amelia Johnson. In this issue, which is all about planning, you’ll find expert planning tips, the prettiest real weddings, the latest in bridal fashion, and the sweetest editorial shoot put together by Janie Medley (@TheBridesCafe) along with Dana FitzGerald (@danamfitzgerald), Moya Minns (@moyaminns), and photographed beautifully by Amelia Johnson (@ameliagjohnson). Our debut Winter 2012 digital edition will be available on February 21st. In the meantime, we would love for you to subscribe to our digital newsstand to get an instant update once it goes live. 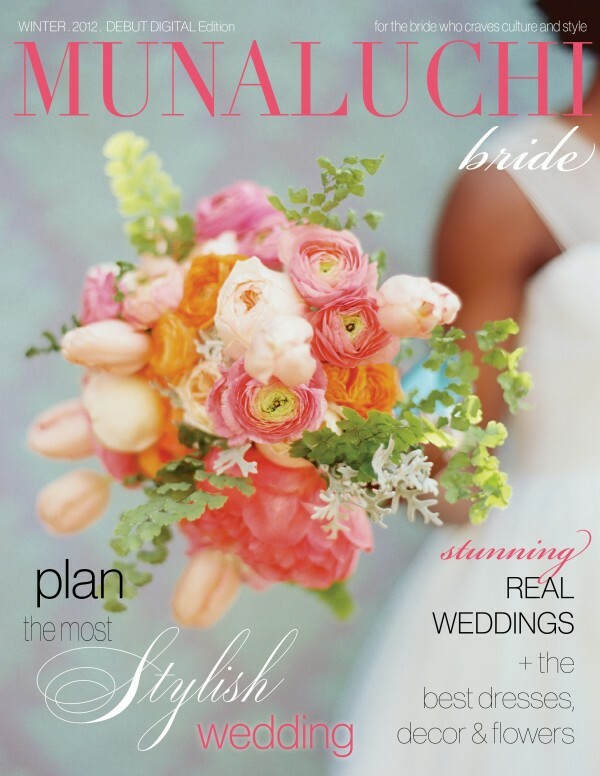 Be sure to visit munaluchibridal.com to check out Munaluchi’s FREE debut digital issue. 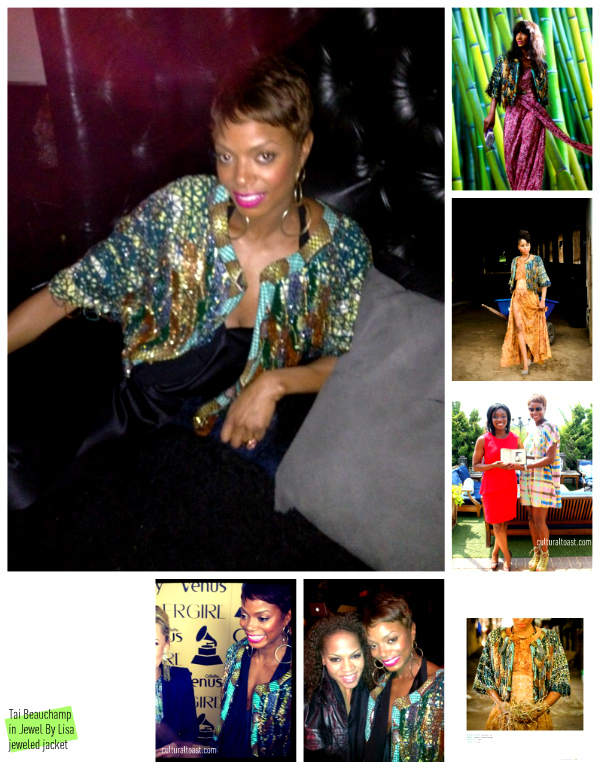 CulturalToast.com congratulates the entire staff at Munaluchi especially the ever stylish editor in chief Jacqueline Nwobu and creative director Eronmwon Balogun! Cultural Newsstand highlights the cover stories seen on international newsstands. L.A.M.B., Burberry Prorsum, Gregory Parkinson, Boxing Kitten, and countless others in recent years has looked to African Wax Print fabric to add that extra essence to their collections. 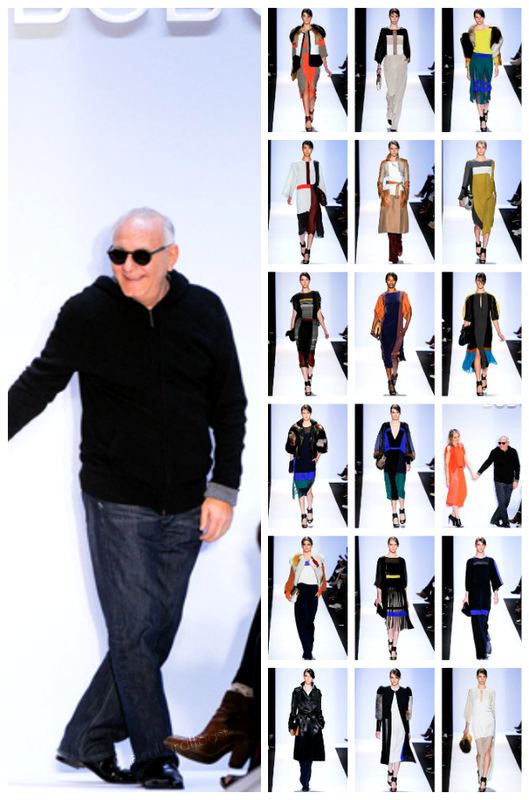 So it comes as no surprise that the latest designer-collaborative effort at H&M, Marni has also followed suit. Marni and its creative director Consuelo Castiglioni just held a red carpet celebration for their collaboration with H&M. Attendees Imogen Potts, Milla Jovovitch, Mena Suvari, Sofia Coppola, and Jessica Chastain caught our attention wearing traditional West African fashion dresses. 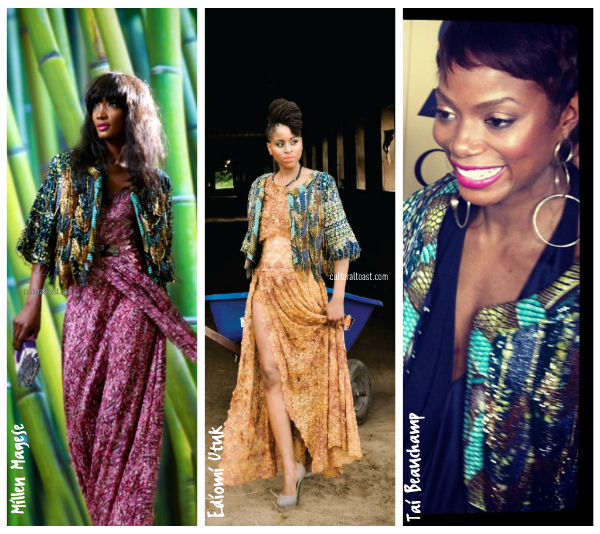 We love the attention West African fabric is getting on a global scale. If these red carpet worthy looks are any indication, Marni for H&M will definitely be a huge hit which follows suit with last season’s success Versace. Check out the entire Marni for H&M lookbook here which includes not only womenswear but accessories and menswear. Expect plenty of patterns for this new high-fashion H&M line. 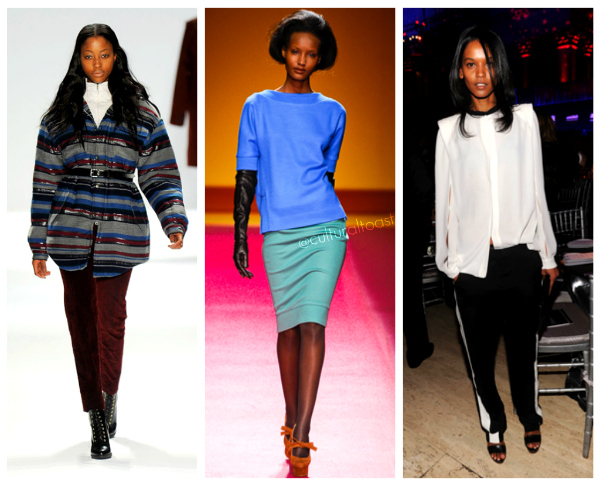 My two cents: Lady Gaga, Kate Bosworth, Solange Knowles, Anna Wintour, June Ambrose, Tai Beauchamp, Angela Simmons, LaLa Vasquez, Khloe Kardashian, Nicole Ari Parker, Heidi Klum, Esperanza Spalding, Catt Sadler, Elle Varner, First Lady Michelle Obama, and many more have all embraced a trend that’s been in vogue for centuries. 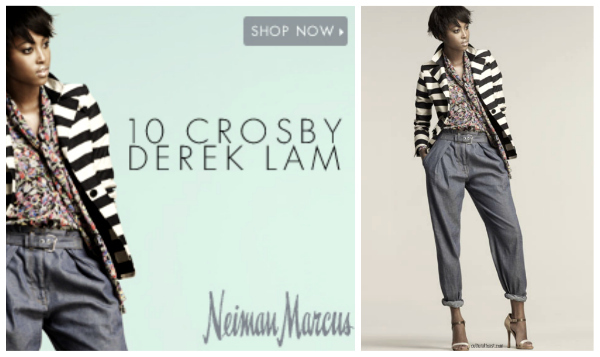 It’s a trend worth looking at it and it’s certainly not a fad. 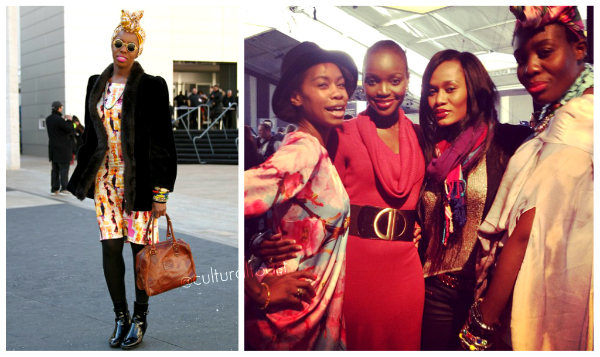 The fascination with African wax print fashion is the originality and creativity that comes with it. 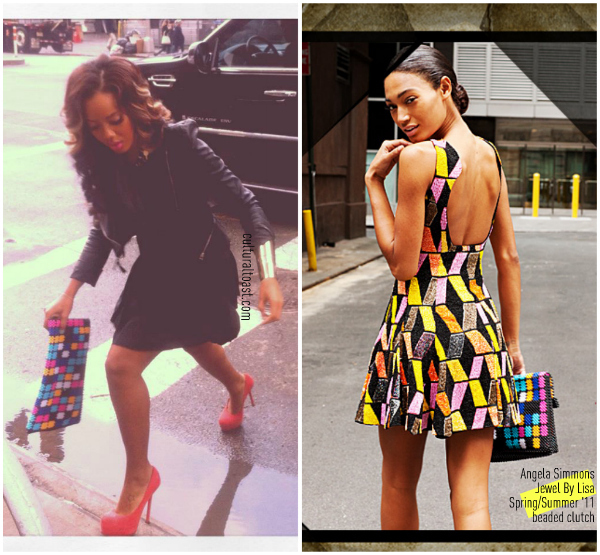 The endless possibilities on how to wear it has birth many designs and tumblr pages. 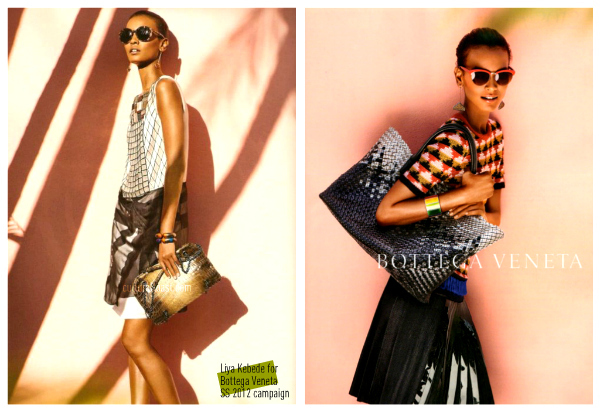 Marni for H&M hits stores March 8th! Grammy Award winning vocal powerhouse Whitney Houston has passed away at the age of 48. The Newark, NJ star (who discovered by her mentor Clive Davis) was found dead in her Beverly Hills Hilton hotel room and she was in Los Angeles to celebrate the Grammy’s and attend Clive Davis’ annual pre-Grammy concert tonight. She is survived by her mother Cissy Houston, her only child and daughter Bobbi Kristina, her cousin Dionne Warwick, her godmother Aretha Franklin, and her ex-husband Bobby Brown. 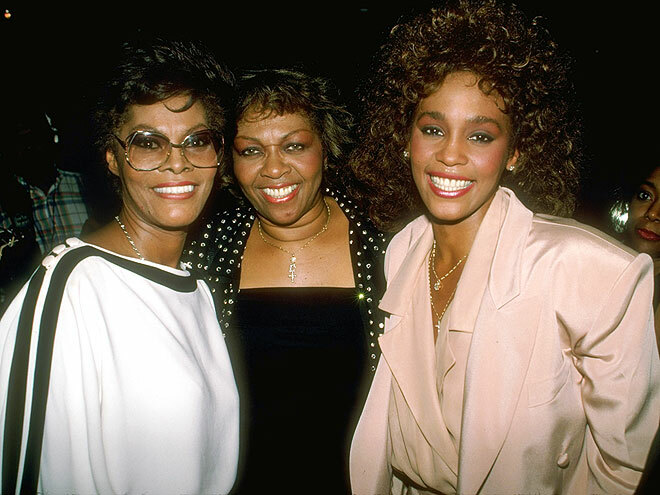 Jennifer Hudson and Chaka Khan is scheduled to perform a riveting tribute to Whitney at tonight’s Grammy Awards. So sad to hear Whitney is really gone. I hope it was a sick joke but it’s actually true. Not only is this tragic but extremely upsetting. 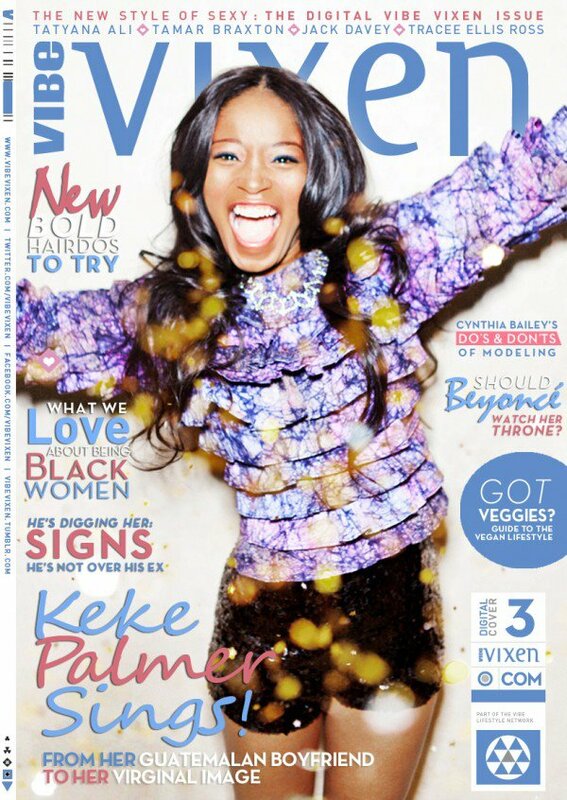 She just wrapped up production on her film, Sparkle and she was also preparing for a musical comeback. Whitney not only had the Voice but she was a gifted actor from her memorable roles in The Bodyguard, The Preacher’s Wife and Waiting to Exhale. This is a vocalist who had I to memorize her music for my grade school graduation and school assemblies. She was THE voice of pop music. Rest in peace, Whitney. Cultural Remembrance is a feature honoring the dearly departed.